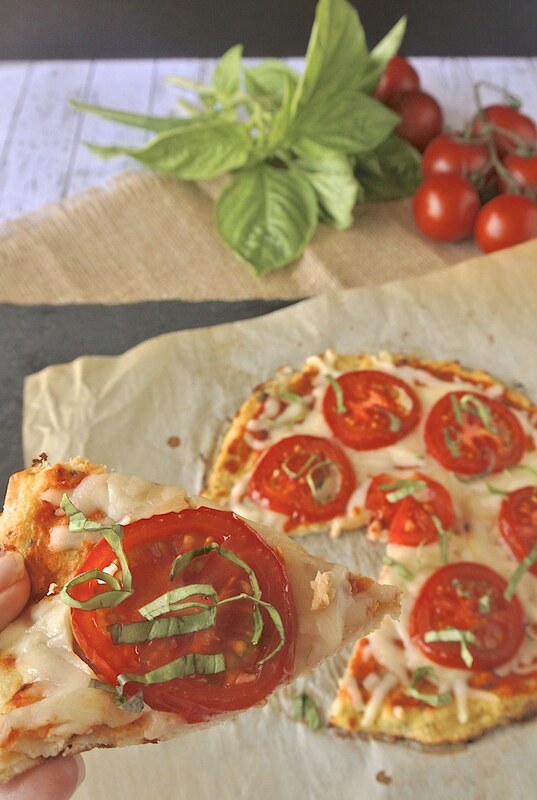 Cauliflower Crust Tomato Basil Pizza. It looks like pizza, it is just not made with regular pizza dough. Blended cauliflower is substituted for flour and with the addition of basil, Parmesan, mozzarella and goat cheese which is delicious and makes it low carb as well as keto friendly. I love a good pizza as much as the next person, but I don’t always like the heavy feeling that comes along with eating the dough, you know the feeling. Don’t get me wrong, I can eat regular pizza just about everyday, but sometimes it’s good to eat a little lighter. So after doing some research, it would seem that the cauliflower pizza crust has become popular recently. Since there are so many people going gluten-free, by choice and for dietary reasons, I had to see what all the fuss was about. The crust is started by making ‘cauliflower rice’. Not as difficult as it sounds as the food processor does all the work, well most of the work. Using a medium sized head of cauliflower, pulse the cauliflower florets until they turn into a fine powder. Then you have to cook/dry the the cauliflower, which is done in the microwave, this also helps remove some of the moisture. If you don’t have a microwave, spread the cauliflower rice onto a parchment-lined baking sheet and bake at 300°F for 5 minutes. Once the cauliflower is cooled, it is then wrapped up in a clean dish towel and now it’s time to use your muscles. You need to squeeze out as much of the liquid as possible. If you don’t get at least 1/3 cup, keep wringing, you know you can do it, it’s worth it and there’s always the calorie burning benefit. The more moisture you can remove, the better the crust will be. 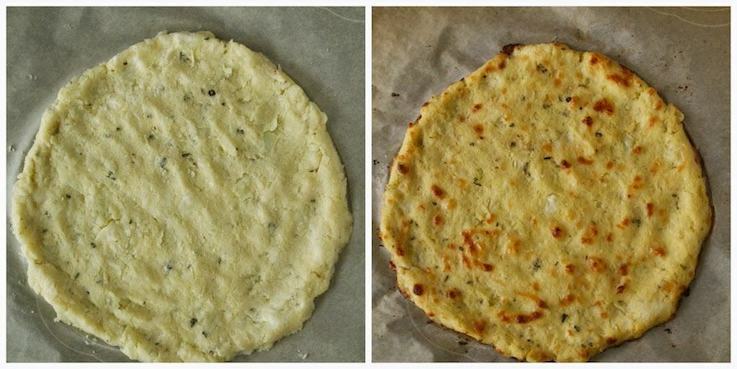 The above images show the crust before it goes into the oven and after. It looks good enough to eat on it’s own, doesn’t it? Once you’ve wrung out as much liquid as humanly possible, the cauliflower goes into a mixing bowl, then you add all the flavors and ingredients that help bind the dough. What I really love about this crust is the addition of goat cheese. I made one with goat cheese and one without and really did prefer the one with. You don’t taste the tang from the cheese, it just gives the crust great texture. Parmesan cheese is also a delicious option. The key to the crust is the egg, just like most recipes, it’s needed to bind the crust and hold it together. There’s no rule to the shape that you have to make, it’s a personal choice. But, it is very important to use parchment paper on your baking sheet because it is the only thing, other than a silicone mat that the dough will not stick to. At this point you’re almost ready for the toppings, but first the crust must baked in the oven so it will be sturdy enough to hold the toppings. For this recipe I chose to make a tomato basil pizza because the vine on tomatoes looked so good in the supermarket. So there you have it. 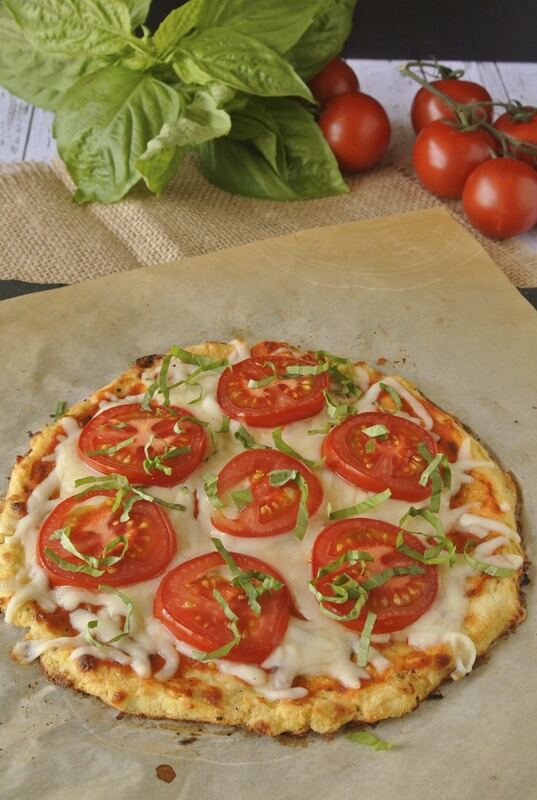 This Cauliflower Crust Tomato Basil Pizza is a great tasting pizza and you won’t even miss the dough. 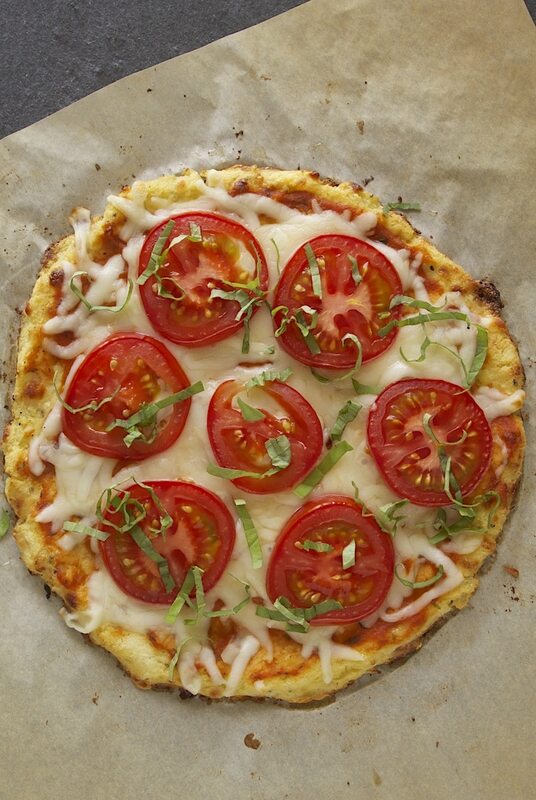 If you’ve tried this Cauliflower Crust Tomato Basil Pizza or any other recipe on the blog then don’t forget to rate the recipe and let me know how you got on in the comments below. I love to hear from my readers! You can also FOLLOW ME on FACEBOOK, TWITTER, INSTAGRAMand PINTEREST to see daily recipe updates. Blended cauliflower is substituted for flour and with the addition of basil, Parmesan, mozzarella and goat cheese which is delicious and makes it low carb as well as keto friendly. Add the florets to a food processor. Pulse until you get a fine powder. Transfer the cauliflower powder to a microwave safe dish. Lay a clean dish towel out on a flat surface, pour the cauliflower onto it and allow to cool to the touch. Wrap the cauliflower up in the towel and wring out as much liquid as you can. Transfer the cauliflower to a large mixing bowl and add the egg, salt, dried basil, 1/3 cup mozzarella, parmesan and goat cheeses. Mix well. Cover a baking sheet or pizza round with parchment paper. Turn out the cauliflower mixture onto the parchment paper. If you are making 2 individual pizzas use 2 sheets. Shape into your desired shape. Brush olive oil lightly over the dough and bake for 15 minutes. Remove from the oven and top with your favorite toppings. Return back to the oven and back for another 5-7 minutes until the cheese is bubbly. * If you do not have a microwave, you can spread the powdered cauliflower onto a baking sheet or ovenproof dish, cover with foil and bake at 300 for 5 minutes. This was the BEST cauliflower pizza crust recipe ever! Thank you so much! I had to cook it for a bit longer than recommended. I think next time, I will press it even thinner than I did the last time. 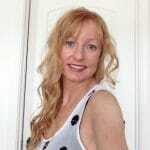 Thank you so much Kathy, I’m glad you liked it and found what works for you. Not all ovens are calibrated the same so that could be the reason you needed to cook it longer. Thank you for visiting. You really need the egg in the crust to hold it together so I’m not sure how this could be made vegan, but I’ll think about it. This is great as I was looking for a gluten free and YEAST free pizza crust….just wondering if you were looking for vegan as well you could substitute fake cheese but what about the EGG? Doesn’t that hold the crust together? I’ve updated the recipe with the nutrition information. Thanks. Janette I made my pizza today and it was delicious! Thank you so much for sharing this wonderful recipe!! Hi Janette,I really want to make this and I have been gathering all of my ingredients. I wonder if you have any suggestions for an alternate method for cooking the cauliflower once it’s in powder form as I don’t own a microwave. Hi Katina, I’ve added a solution to the recipe. You can bake the cauliflower for 5 minutes in a 300 degree oven, covered. Good luck and enjoy your pizza. How would you make this without using a microwave? This recipe looks amazing, but I don’t like goat cheese. Can you recommend a substitute? Hi Alicia, you can use any cheese you like. Thank you for visiting. You could put the cauliflower on a baking sheet and cook in a 350 degree oven for 5 minutes. what do you suggest, if you don’t have a microwave? I love this recipe. Can’t wait to make it. Thanks for sharing on Foodie Friends Friday. Pinned/shared. Can’t wait to try this one, fresh cauliflower, basil, and tomatoes…Yum! Just pinned to try when my tomatoes are ripe. This looks like a regular pizza and so good. This is a great idea! I am seeing cauliflower based crusts all over the place, but, your recipe is great! Love the tomatoes too! OMG! I’m at a loss for the best words to describe this crust. Thanks so much Janette for this awesome recipe! This sounds ahhhhhhhmazing! I have yet tp try the cauliflower crust, the addition of goat cheese is AWESOME! Absolutely love the pics too! Beautiful work!